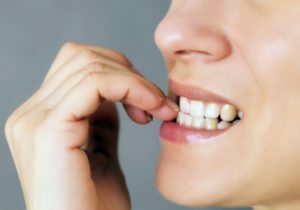 Nail biting is usually a habit developed from anxiety. Not only does it look unsanitary, but it can chip your teeth and impact your jaw. Biting your nails puts pressure on your jaw which can lead to jaw dysfunction. A simple way of stopping yourself from biting your nails is to use bitter-tasting nail polish so the taste will curb you from biting. You can also hold something to keep your fingers busy during a time of stress or anxiety. Believe it or not, there is such a thing as overbrushing. Brushing your teeth for 2 minutes, twice a day is a great way to keep your teeth healthy. But, using a hard-bristled toothbrush and brushing too hard can damage your teeth and irritate your gums. You can break this habit by using a soft-bristled toothbrush with an ADA (American Dental Association) Seal of Acceptance. When you brush, think of it has massaging your teeth rather than scrubbing them. This is usually a habit formed at night that can cause chipping or cracking, painful chewing, and joint pain in your jaw. You can achieve less tooth damage, pain, and muscle soreness by using a nighttime mouthguard while you sleep. Your Zionsville dentist can create a mouthguard for your specific needs to give you a better night’s sleep and keep your teeth healthy. Your tooth enamel is the strongest material in your body, but it can still be broken by hard foods and objects like ice. People like crunching on ice because it’s refreshing and keeps their mouth busy. If you suffer from this habit, drink beverages without ice to avoid tempting yourself or use a straw to prevent accidentally chewing on ice. Constantly snacking, especially on sugary and fatty foods, can put you at higher risk for cavities. Bacteria left over from your snacks will produce acid that eats away at your enamel. Avoid this by eating healthy, well-balanced meals to feel full throughout the day. If you need a snack, try raw vegetables and fruits. Once you’re aware of a bad habit, you can break it! Recognize your habits and use our tips to get out of them to keep your teeth looking and feeling great. Dr. Angelo M. Julovich loves to help his patients and listen to their needs to provide the best care possible. He understands the direct link between a person’s smile and their self-esteem, which is why he enjoys helping patients’ smiles feel healthy and look beautiful. He currently practices at Trinity Dental where he can be contacted through his website or by phone at (317) 769-3335 for any questions.